This season, Wisconsin's Sojourn Shelton has amassed 30 tackles with four interceptions and earned honorable mention all-Big Ten status from the media. No other Badgers player has more than one interception. MADISON, Wis. — Before this football season, Gary Andersen asked each of his players to write down a list of goals they hoped to achieve when the year ended. Cornerback Sojourn Shelton, a freshman with plenty of talent but lacking in size, wrote that he simply wanted to start at least one game. If he worked hard enough, Shelton told himself, maybe he could even start at mid-season, some time after the Ohio State game when coaches could begin to trust him more. Shelton, it turns out, surprised even himself with his performance. The 5-foot-9 native of Fort Lauderdale, Fla., not only started one game but he also has started 11 of 12 games overall for Wisconsin (9-3) and will once again be a stalwart at the back end when the team plays South Carolina (10-2) on Jan. 1 in the Capital One Bowl. "It’s been crazy," Shelton said following Thursday’s practice. "I feel I worked pretty hard in the summertime and the coaches rewarded me with it. My whole thing is just don’t lose it. Continue to progress. Show them the drive that I’ve had since Day 1 that I got here. Just keep progressing." Progress is something Shelton has made daily since he first stepped foot on campus as an early enrollee last spring. He weighed 150 pounds when he arrived and knew a player with his physique couldn’t compete at a Big Ten level without packing on pounds. So he gave up the fast-food meals he ate back home, accepted a stricter diet regimen, lifted weights and drank protein shakes. By the time fall practices came, Shelton had bulked up to 172 pounds. "You always heard me say I knew I could play with the guys," Shelton said. "It was just a matter of putting on the weight and being able to physically play with them. I knew I could put it on. My father, he’s not big, but he has the frame. My grandfather is like 210 (pounds). I knew I could put the weight on. It was just a matter of getting in a program where I was lifting, eating right. I wasn’t surprised once I got it on. But I was truly happy. That was a determining factor I feel." Andersen has raved about Shelton’s maturity, both on the field and off it. His rise provided a much-needed boost to the secondary, which is part of a unit that ranks No. 12 nationally in passing defense (192.7 yards per game). This season, Shelton has amassed 30 tackles with four interceptions and earned honorable mention all-Big Ten status from the media. 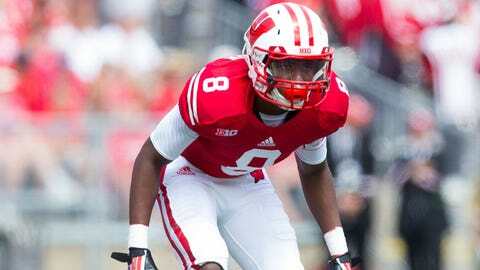 No other Badgers player has more than one interception. In fact, the rest of the team has five interceptions combined. "I think everybody tries to pick on me because I’m a freshman and I’m so small," Shelton said. "And honestly I like that. I like the challenge. My whole thing is when the ball is in the air, just do what you do. It’s like taking it back and playing with your friends back in the yard. You just catch the ball and you don’t think anything of it. Play like you’re playing at home but understand in college it is a game where you have to read your keys. But when the ball is in the air, it’s anybody’s ball." Badgers cornerbacks coach Ben Strickland said Shelton needed to continue his physical development because of the nature of the position in the Big Ten. Some of the best receivers in the conference this year, for example, were substantially bigger than Shelton: Penn State’s Allen Robinson (6-3, 210 pounds), Indiana’s Cody Latimer (6-3, 215 pounds) and Northwestern’s Tony Jones (6-0, 195 pounds) among them. And though Shelton had four interceptions, he returned them for a total of 10 yards. Strickland said a player with more strength could stay on his feet longer and gain more yards after the catch. Still, Strickland has been impressed with Shelton’s ability. He compared his play and body type to former Badgers cornerback Scott Starks, whom Strickland once played with at Wisconsin. Starks, a 5-9, 176-pounder, was selected by the Jacksonville Jaguars in the third round of the 2005 NFL Draft. "He might be small in weight or size," Strickland said of Shelton, "but he’s got length in his arms and obviously you match that with his speed and he can make up for that." This season has by no means been perfect for Shelton. He pinpoints his low moment as the Arizona State game, in which Shelton was flagged for three penalties — a holding and two pass interference calls. But it wasn’t the penalties so much as his reaction to them. After one pass interference play, he was visibly demonstrative and upset on the field. Afterward, both Andersen and Strickland told him that type of behavior would not be tolerated. "That was just a product of growing pains," Shelton said. "You look at any other pass interference call I got, the one at Penn State, I learned from it. You get it. Hey, sometimes the call might not be pretty good. But you’ve just got to move forward and forget about it and move on to the next play. But I think Arizona State was my growing moment. Between that and Ohio State, that was the most fun game that I played in. Arizona State I think definitely took me from a little boy to something else." Shelton already has taken to gaining every edge possible in studying Wisconsin’s bowl game opponent. Two of his best friends, Florida’s Vernon Hargreaves III and Georgia’s Shaq Wiggins, are defensive backs whose teams have played against South Carolina as freshmen this season. Georgia even beat South Carolina 41-30 on Sept. 7. Shelton sent each friend a direct message on Twitter as soon as the bowl pairings were released and picked their brains on the phone. He said he recognized Gamecocks quarterback Connor Shaw has had plenty of success throwing the ball, with 21 touchdowns and one interception, and is likely to test Shelton. As he has done all season, Shelton is ready for his opportunity. "They have a tendency to go after the young guys," Shelton said. "That’s something I’m excited for. They’re a good bunch of receivers, and it’s going to be a good challenge."